Salman Khan-Katrina Kaif's Tiger Zinda Hai Trailer Gets Roaring Response By Fans! Home BOLLYWOOD Salman Khan-Katrina Kaif’s Tiger Zinda Hai Trailer Gets Roaring Response By Fans! Salman Khan-Katrina Kaif’s Tiger Zinda Hai Trailer Gets Roaring Response By Fans! Finally, Tiger is here! The much-awaited first trailer of Salman Khan and Katrina Kaif starrer Tiger Zinda Hai is out and it promises action, romance and tons of entertainment. The much-awaited theatrical trailer of Salman Khan, Katrina Kaif starrer Tiger Zinda Hai has been released on YouTube. And the trailer has become an instant hit. 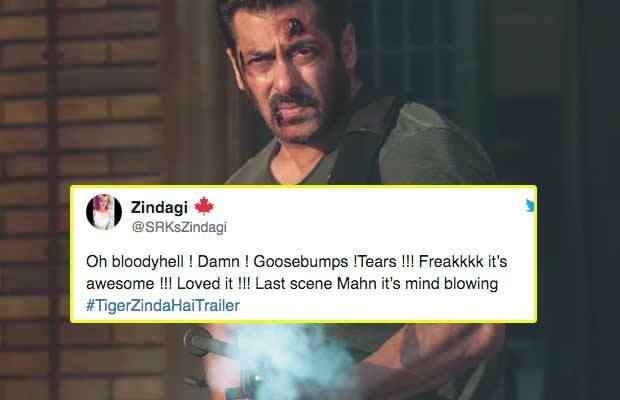 Salman Khan fans have gone berserk over the new trailer. The trailer is receiving a huge response on social networking websites and is already trending on top on Twitter. Tiger Zinda Hai continues the story of two super spies Tiger and Zoya eight years later. Shot across various international locations with sleek production values, this mega espionage drama promises thrills, romance and tons of entertainment. NO ONE HUNTS BETTER THAN TIGER ? #TigerZindaHaiTrailer one word to defined stardom is salman khan. Slated to release on December 22, Tiger Zinda Hai is one of the most anticipated films of the year. Tiger Zinda Hai is also an important film of the year for Salman Khan as well his previous release- Tubelight proved to be a murky failure at the Box Office. Previous articleTiger Zinda Hai Trailer Out: Salman Khan-Katrina Kaif Promises Thrills, Romance And Entertainment!